Place a pea-sized dab of fluoride toothpaste on the head of a soft bristled toothbrush. Choose a soft bristled toothbrush. Use the edge of the toothbrush in a massaging motion. Also, use a child’s toothbrush to brush at the gum line. If there is blood, be more conscientious about brushing at the gum line since this is a sign of infection. Move the brush across the teeth using a small circular motion. Use this motion to clean one tooth at a time. Keep the tips of the bristles against the gum line without pressing too hard. This will let the bristles reach into gaps between the teeth. Use the same small circular motion to clean the backside of the upper and lower teeth as well. Give your tongue a few gentle brush strokes, brushing from the back of your tongue forward. This removes bacteria and freshens your breath. Brush your teeth for two to three minutes and then rinse your mouth with water. 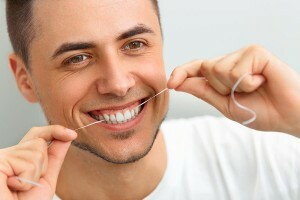 Clean around your teeth with dental floss to keep your gums healthy. Careful flossing will remove plaque and leftover foods that a toothbrush cannot reach. Floss your teeth once a day since it gets rid of food and plaque between the teeth, where your toothbrush cannot reach. If plaque is not removed, it can harden into tartar, which must be removed by a dentist. If brushing or flossing causes your gums to bleed then see your dentist. Your dentist may prescribe a bacteria-fighting mouth rinse to help control plaque and swollen gums. Use the mouth rinse in addition to careful daily brushing and flossing. 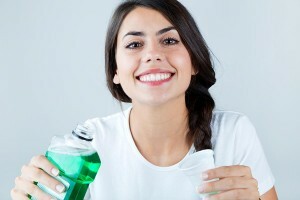 Mouthwashes have antiseptic qualities and it is an instant solution for bad breath. The use of mouthwash does not eliminate the need for both brushing and flossing. Mouthwash also helps remove mucus and food particles deeper down in the throat. Oral infections and tooth decay can be prevented by using an antibacterial mouthwash and brushing regularly.